But this one is also about family. Gaining a new one or finding an old and lost one. 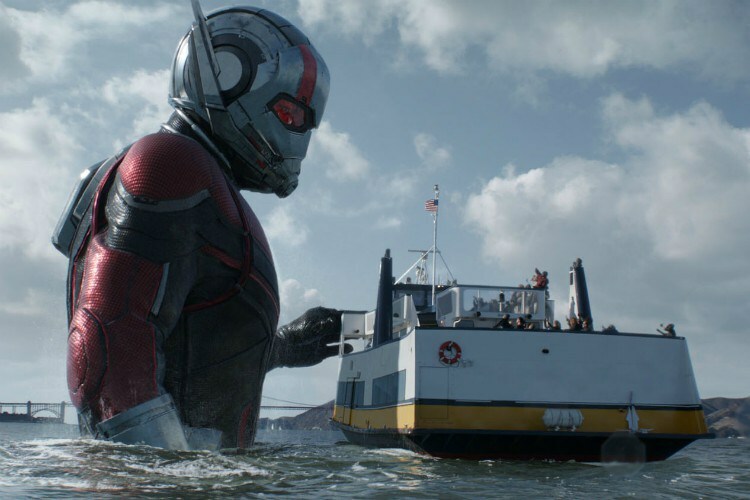 Throughout it all, Ant Man and the Wasp is a damn good and fun movie. I loved it. 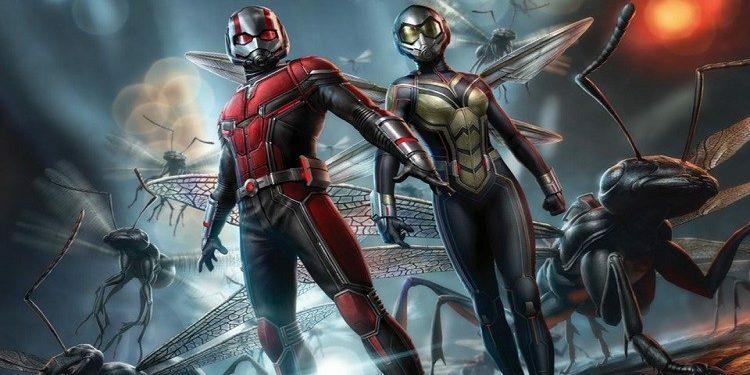 Ant Man And The Wasp is the last movie from the MCU for 2018. We’ll have to wait for Captain Marvel at the beginning of 2019 (March 8th), but for what it is, Ant Man And The Wasp is not just one hell of a sequel, but one hell of a fun/awesome movie. Period. 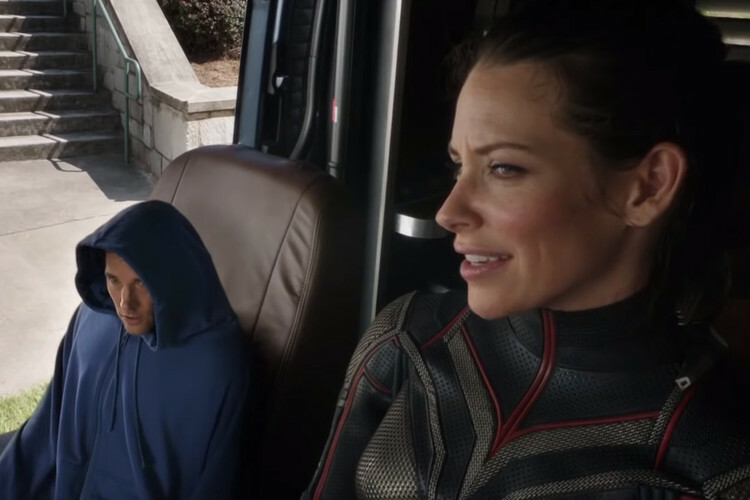 And Ant Man And The Wasp begins at the very end of Scott Lang’s 2 year long house arrest. Lang (Paul Rudd) has just 3 days left in house arrest for breaking the Socovia accords (in Avengers Civil War ) and he’s going out of his mind. But his mundane house routine will be abruptly shaken up by the vision of Janet Van Dyne (Michelle Pfeiffer). She’s apparently live and has been stuck in the Quantum realm for 30 years and Hank Pym (Michael Douglas) along with his daughter Hope (Evangeline Lilly) will do whatever it takes to get her back. However, their plans will take a small U-Turn since a small time crook and a dying girl are after their extraction technology. Ant Man And The Wasp is smooth as a Velveta. Seriously. Action packed and uber fun, this sequel is something else. But let’s start with the main character. Scott Lang is a changed man. At least that is the result of a 2 year forced stay in his house. His relationship with his daughter is much stronger and it serves as an emotional anchor. His relationship with with his ex wife (Judy Greer) and Jim Paxton (Bobby Cannavale) is improved too, and he’s now making security systems instead of breaking them. Along with Luis (Michael Pena) Dave (T.I) and Kurt (David Dastmalchian) the 4 ex-convicts now run X-Con Security (a brilliant name I might add). Before we I go any further, can I take a note of how amazing Paul is in this character? 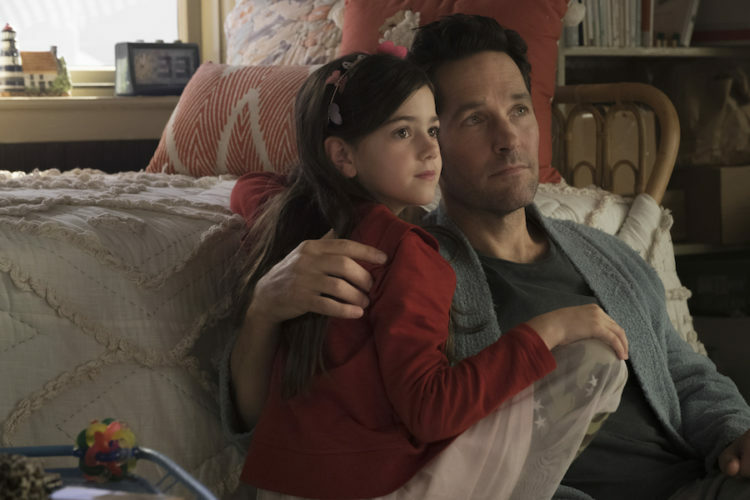 He seems even more comfortable playing Scott Lang in the sequel, and it clearly shows in almost every scene. His charm and goofy appeal are in nitro speed now, and you can plainly see that he’s having so much fun to watch whether, he’s a 12 feet Ant Man in the San Francisco peer or a Michelle Pfeiffer reincarnate in the middle of Hank’s lab. He’s amazing. 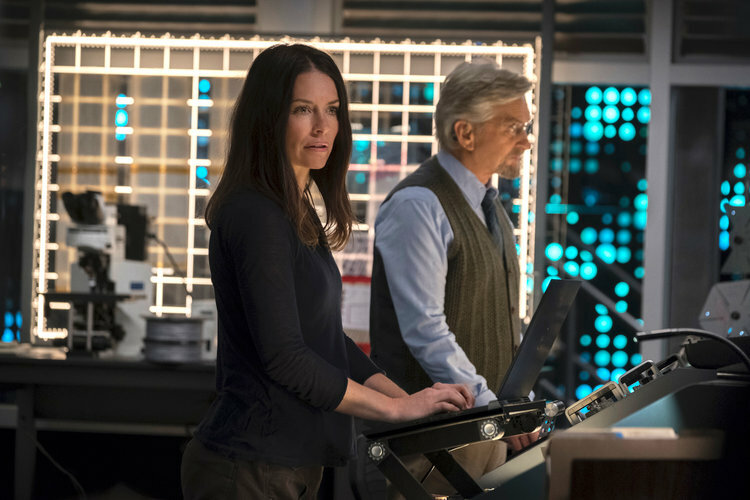 Evangeline Lilly’s Hope and Michael Douglas’s Hank characters (thankfully) are now given more screen time in the sequel. They’re also now more in the action part of the film and that’s even more amplified with the introduction of the Wasp in the fight scenes. Lilly is absolutely stunning in the role of the Wasp and the same can be said about her fight scenes. They help her elevate her character on a whole another level, and make her into an incredible super-hero. But the combat scenes are brilliantly crafted and well spaced throughout the entire movie. However, the second half of the movie is one of the action packed portions of any Marvel movie I’ve seen in quite some time. 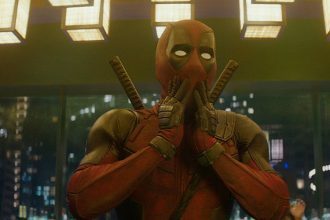 The action scenes fit in the movie perfectly without giving the impression that the movie is stuffed and chocking on mindless action just for the sake of action thrills, and the last 60 minutes or so are the perfect balance weight to the first hour of the movie. And as for the rest of the characters some of the old ones are fantastic yet again. 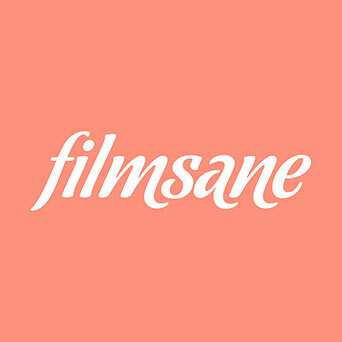 Luis (Michael Pena) is given another moment to shine with his tireless confusing blabbering antics, and it’s sooo much fan to watch- AGAIN!. He delivers some of the most comedic moments in the entire movie and at times he’s dangerously close to overshadowing his buddy Paul Rudd. Which says a lot. However out of the 2 new characters that are introduced here in the sequel (and both of them 2 are villains), only one has a potential to elevate and make oneself memorable. While I adore Walton Gogins talent, I’m afraid he’s just another generic villain with a southern accent, that we’ve seen him play time and time again. Sonny Birch is predictable cliché, and quite frankly if the character wasn’t in the movie at all, there wouldn’t have been any noticeable difference. 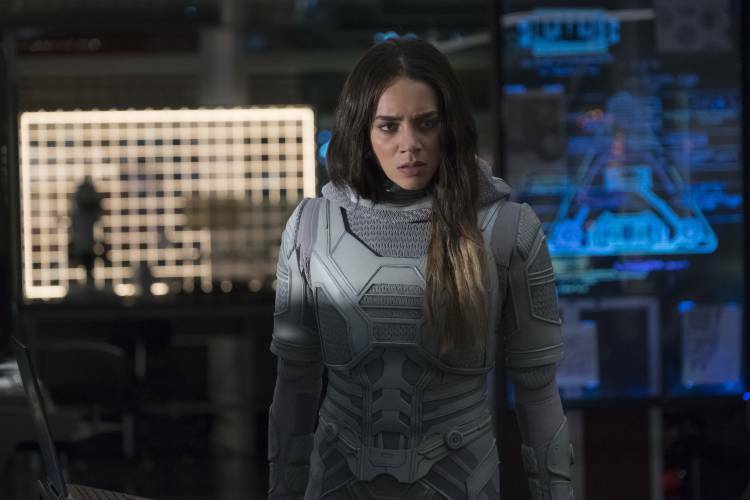 Ghost (Hannah John-Kamen) is a different character. Her motives are more personal (as opposed to Birch’s greed) and her anomaly makes her selfish and generally bad but with a set of redeemable qualities near the end. Both of them (despite their development shortcomings) find a way to make themselves a bit memorable and to fit in this movie like long lost pieces of the puzzle. And it works like a charm. 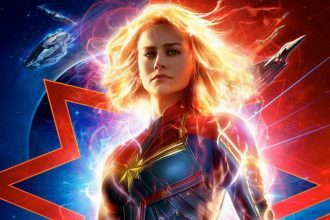 The scrip albeit flawed, offers linear progression that is easy to follow from A to B to C points of the movie, and the overall tone of this film is fun and coherent mess that only Marvel can manufacture. But this one is also about family. Gaining a new one or finding an old and lost one. Throughout it all, Ant Man and the Wasp is a damn good and fun movie. I loved it.